Paint manufacturers are moving beyond just offering paints; they are now selling an experience. The product category is fast moving towards offering services and experience to customers. Service is what people seek today. Paint is one such industry where a consumer’s mind has always been dominated or influenced by a contractor’s thought. Earlier, it was rare that the consumer would walk into a paint store and buy it. But now the paint manufacturers are evolving their stores to attract a customer to walk in and get an experience of painting their house. The concept of experience centres is being followed by almost all the leading manufacturers including Akzonobel, Jotun, Berger, Nerolac and others. Today a customer is well traveled and very aware of what goes around not just in their city but throughout the country and the globe. Internationally, it has been understood that experience is what creates a consumer forever. 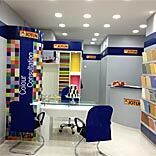 The paint retail scenario in India has been concentrated and confined to the B2B sector where the contractor does all the paint shopping. The practice has been such that consumer is unaware of the products being used. “Experience centers offer a tremendous opportunity to provide the Indian consumers world-class shopping versus a regular shopping which is limited to colour selection through usage of conventional tools and the shopper does not go beyond the dealer counter. Also, consumers need to be made aware of the different products offered and their benefits”, says Amit Arora, Business Manager, Decorative Paints, Akzo Nobel India. Standalone stores have become a prime concept for the retail industry where brands are no more relying on multi brand retail stores to generate sales. The brands now want to give special and unified attention to consumers and offer them exclusive services. Same is happening in the paints arena as well. “Keeping our primary target i.e., consumers in mind, our experience centre provides an opportunity to the entire family to come together and take an informed decision by providing an inspirational ambience at the point-of-sale. The Dulux Decorator Centre provides benefits to other stakeholders as well. For instance, the DDC becomes a hub for upgrading of skills of core group of painting contractors, which is essential, since they provide the delivery of the painting experience to consumers,” says Arora. “The centre is a complete one- stop shop that fulfills all painting related needs of consumers. It provides a spacious and well-lit shopping environment, complete with state-of-the-art colour tools such as Margherita Display and colour visualisation software. The colour consultants help the consumers in getting the right contractor to get their home painted,” he adds. Paint manufacturers are looking forward to initially catering to the markets that are high on incomes and are prominent in terms of growing property. The target regions for Akzonobel is towns which have high per capita consumption such as Delhi, Mumbai, Surat, Ludhiana, Jalandhar, Calcutta, etc while Jotun with its brigade of 330 dealers of which 70 per cent are experience centres now looks at penetrating further into markets in South and West India along with the Northern region. “We want to grow stronger in these areas and look to other places later. We plan to add 50-60 stores in a year of which most would be experience centres,” adds Jijina. Experience centres are the way ahead for this industry as well and will take it to greater heights as more and more people engage in experiencing colours for their homes.